- Place eggs in a single layer in a large saucepan; add water to cover eggs. Bring to a boil; cover, remove from heat, and let stand 15 minutes. - Drain and fill pan with cold water. Tap each egg on the counter until cracks form all over the shell, and carefully peel. - Cut eggs in half lengthwise, and carefully remove yolks. Mash yolks with mayonnaise. Stir in bacon and all ingredients except for paprika, blend well. 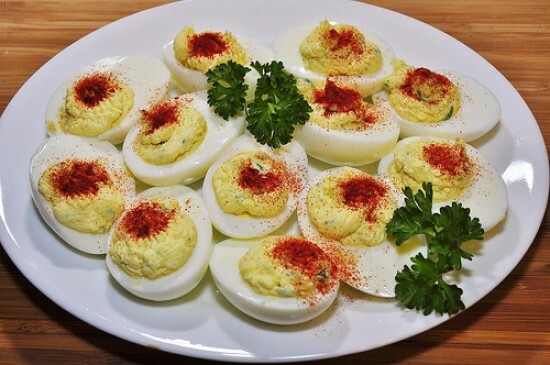 - Spoon mixture into eggs, garnish with smoked paprika.